The Board of Directors of the Cambodian Health Committee has named Mr. Heng Bunsieth as the new Executive Director of the CHC. Bunsieth comes to the CHC from his position as executive director of Action for Health Development (AHEAD), a local community-based NGO he helped found to improve the care of people with HIV/AIDS, TB, and malaria in Cambodia. "Bunsieth brings to the CHC unmatched experience in managing international and local non-governmental organizations (NGOs) delivering community based health care in Cambodia," say Dr. Anne Goldfeld, CHC cofounder. "We are thrilled that he will be CHC's new Executive Director following the retirement of former executive director, Dr. Sok Thim." Bunsieth received his medical education in the extremely challenging conditions of Site II, the largest refugee camp established on the Thai/Cambodian border in the 1980's to shelter hundreds of thousands of civilians displaced by the war. A refugee himself, Bunsieth attended the medical school in the camp run by the American Refugee Committee (ARC), where he was a classmate of former CHC Executive Director Sok Thim. Bunsieth specialized in pediatrics, and ran the pediatric ward and feeding center in the ARC Hospital. At Site II, he first met Dr. Goldfeld, who was serving as medical coordinator of the ARC program and Lori Dostal, longtime CHC board member who followed Goldfeld as medical coordinator. 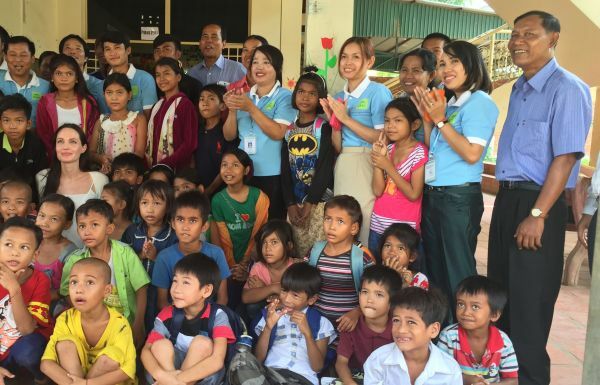 New CHC Executive Director, Heng Bunsieth (far right in blue shirt) at the CHC's Maddox Chivan Children's Center with staff and children during a visit from Angelina Jolie in September 2015. From the start, Bunsieth showed outstanding clinical, management and teaching skills, says Goldfeld. "One day early on in the camp, we were evaluating a child with polio who couldn't swallow, and I asked Bunsieth which cranial nerve was probably involved. Without blinking an eye he gave me the correct answer. I remember thinking at the time, wow! Most of the Harvard Medical School students I worked with back in Boston would not have known the answer to that question," Goldfeld recalls. When the camps were dissolved and the refugees repatriated to Cambodia, Bunsieth went to work with Dostal at Catholic Relief Services (CRS), in Battambang province in the west of the country where most of the refugees repatriated. He quickly rose to the position of team leader and eventually replaced Dostal as the Battambang Health Program Manager when she moved up to become the regional advisor for Southeast Asia. At CRS, Bunsieth spearheaded the development of its community based health care program, which focused on community health development and health system strengthening in collaboration with government authorities and local health workers. This approach resulted in a highly successful child survival project, and later in programs to deliver integrated care for HIV/AIDS and TB, including home care for people living with HIV and TB. "Bunsieth showed a unique ability to combine clinical and management knowledge and skills with the remarkable ability to not only understand, but to manage the staff and work with people at all levels of the Ministry of Health, local leaders and communities," Dostal remembers. "That, and a deep commitment to the villagers being served, allowed him to lead his team to successfully reach their goals." In 2007, Bunsieth led the Cambodian health staff at CRS to found a new local NGO, Action for Health Development (AHEAD), where he was named Executive Director. At AHEAD, he guided nearly 300 staff and government health care workers to provide health education, disease surveillance, and universal access to treatment for HIV, TB and malaria in 7 operational districts of Battambang Province. In addition, AHEAD provided care for TB and HIV in 7 prisons in 5 provinces. Under Bunsieth's leadership, AHEAD received funding from the Global Fund to Fight AIDS, Tuberculosis and Malaria, and several international NGOs, to support its critical work to strengthen the Cambodian health system to fight these treatable diseases. "Because of Bunsieth's reputation and work, AHEAD was able to obtain and maintain independent funding from other international NGOs very soon after its development, a notable achievement," says Dostal. "Frankly, we couldn't believe our luck when Bunsieth applied for the job of executive director of CHC," says Goldfeld. "The combination of his management skills, knowledge about HIV and TB and health in general, and his deep commitment to bringing the human right of health to the poor is unmatched. We look forward to the next chapter of CHC under his leadership."